A divorced and single parent, Eva (Julia Louis Dreyfus) spends her days enjoying work as a masseuse but dreading her daughter's impending departure for college. 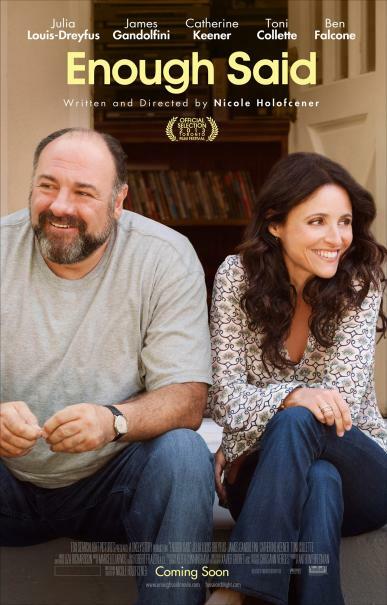 She meets Albert (James Gandolfini) - a sweet, funny and like-minded man also facing an empty nest. As their romance quickly blossoms, Eva befriends Marianne (Catherine Keener), her new massage client. Marianne is a beautiful poet who seems "almost perfect" except for one prominent quality: she rags on her ex-husband way too much. Suddenly, Eva finds herself doubting her own relationship with Albert as she learns the truth about Marianne's Ex. "Enough Said" is a sharp, insightful comedy that humorously explores the mess that often comes with getting involved again.